In July, Chicago remembered the worst maritime disaster of the Great Lakes. On July 24, 1915, the steamship, Eastland, docked in the Chicago River, rolled over while preparing to head to Michigan City, Indiana, for a Western Electric Company day outing. 844 people, including whole families, were killed. 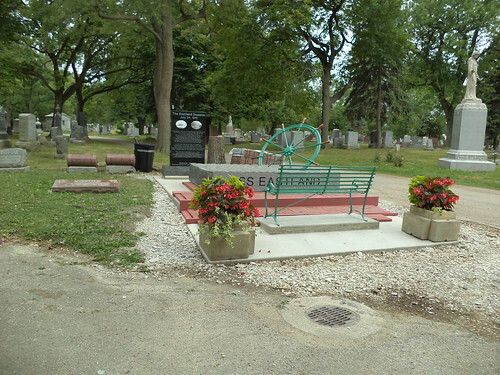 The Eastland Disaster was largely forgotten until the late 1990's, when the Eastland Memorial Society was founded to collect artifacts from the disaster as well as prod the City of Chicago to memorialize this. On July 24th of this year, the 100th anniversary, the city had a program to remember the victims and it was widely covered in local media. I found myself, mid-August, at Bohemian National Cemetery. When I pulled into the cemetery, one of the city's oldest, there was a small sign pointing to the left. "Eastland Disaster Memorial" it said. Curious, I followed the signs. It's not complete. There are still bricks to be added around the perimeter of the memorial. I wasn't sure why this was here. Some research indicates many of the victims were of Czech or Slovak nationality. Bohemian National became the resting place for the most people. Therefore, it would be natural to have a major memorial to the disaster at the cemetery. Bohemian National is quite the place. As you can see, there are many, many monuments from the plain level to the ground stones to plinths and columns. There are quite a few monuments which are artistic works of art. They have an impressive columbarium. It's very peaceful. I should find out when they have tours. I have been aware of the Eastland Disaster for a number of years but I didn't know about this memorial. It's such a sad event in the history of Chicago and the US. This is a fitting tribute to the victims. It reminds me there is so much history around us. All we need is to be aware when we're out and about and it will show itself.